Oh boy Joan... you make the drawing and water coloring part sound so easy! I am in your corner... love this! Lovely pumpkin! I like the card too. even more since you drew it...amazing work. i think it's fantastic - i'm on your side in this debate!! Love your pumpkin Joan! Your hand drawn watercolored cards lately have really inspired me. Stunning! Love the design ... We in Alabama have our windows open, too .. unheard of in August! What a superb painted pumpkin! Your watercolouring is impressive and I too love the splatters. Fantastic pumpkin, Joan! Love the layers of color. This is fabulous - especially since you drew and painted this freehand! LOVE! Wow! Love it! 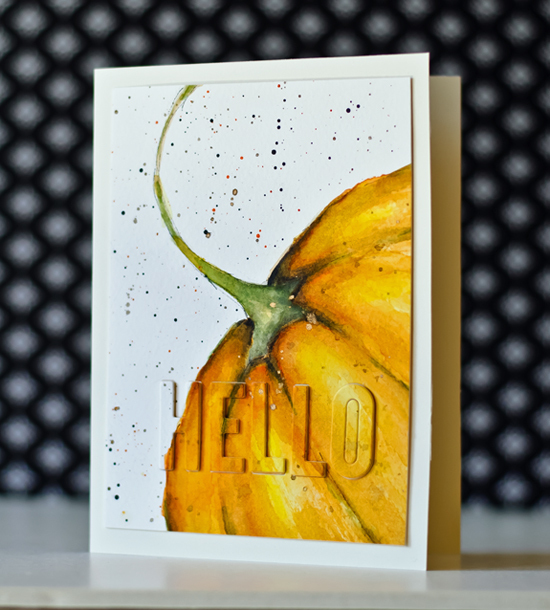 Your artwork is lovely for a card, but I'd be tempted to use it for Fall decoration in the house, too. You know, a framed piece sitting on a table, so you can admire it throughout the day. Beautiful! You can watercolor right out of the park! You don't need a rubber stamp. Crazy beautiful card. Love, love, love it. Hubby didn't like it huh? Is he like mine and when he doesn't like something he says- " mmmmmm it's not your best work." I love your card and think it is amazing you sat down and watercolored your own pumpkin. BRAVO! Love it, Joan--sorry, but hubby is wrong this time! ;-/ I've been mire in a drawing mood than stamping mood lately too. . .
What do husbands know? BUT sometimes they are the only ones around to ask. Frankly I love it, really. To think you drew it free hand makes it more gorgeous. Bravo! I think your card is wonderful!! I LOVE this card, with the biggest L-O-V-E you can imagine! Maybe if you colored the pumpkin electric blue on a school bus yellow background then hubby would like it? And you drew it yourself? Fantastically amazing! I think your husband is out voted on this, your card is AMAZING! OMGosh, Joan, your DH doesn't like this card??? I think it is fabulous! If I made this card it would be framed, yes! I LOVE this card! AMAZED at your painted pumpkin! Mr. DP is out of his gourd (pun intended). I agree that this is an amazing card Joan! Great job! Another drawing? I love it! Mr. DP doesn't know a perfect pumpkin when he sees one, I'm afraid. I think it's perfect. wonderful card!!! I just love it!!! This is jaw-dropping gorgeous!! Love this! I am now inspired by YOUR watercolor card. I think it is beautiful.